We’ve all seen the flood of new releases coming out of BaselWorld, and we all have our own personal favorites. By and large, the product we see coming out of the show is firmly in the four-figure and above range, which makes those watches a bit more aspirational. Alpina, though, they’ve got your back (and your bank account). The swooped right in with an affordable winner in the form of the Alpina Alpiner Quartz. If you’re not familiar with the Alpiner line, you should really check them out. It’s a sportier line, with the focus being on stainless steel cases providing anti-shock, anti-magnetic, and water resistance. IE, the standard resistances you’re going to want in a sport, or everyday, watch. We’ve looked at the Alpiner lineup before, both in a GMT guise (here) and of the three-handed (here) variety. That last one is the review you may want to dive into, as this Alpina Alpiner Quartz most closely resembles that watch. The main difference here is that the Alpina Alpiner Quartz will run you about $600 less than the automatic version, which is nothing to sneeze at. Past that, you’ve got a quartz movement (the AL-240), fixed bezel (no timing bezel), and the date window moves from 3 o’clock down to 6. Past that (and some verbiage on the dial), this quartz version looks a lot like the automatic, with similar case profiles, handset, and the same lovely blue sunray dial. 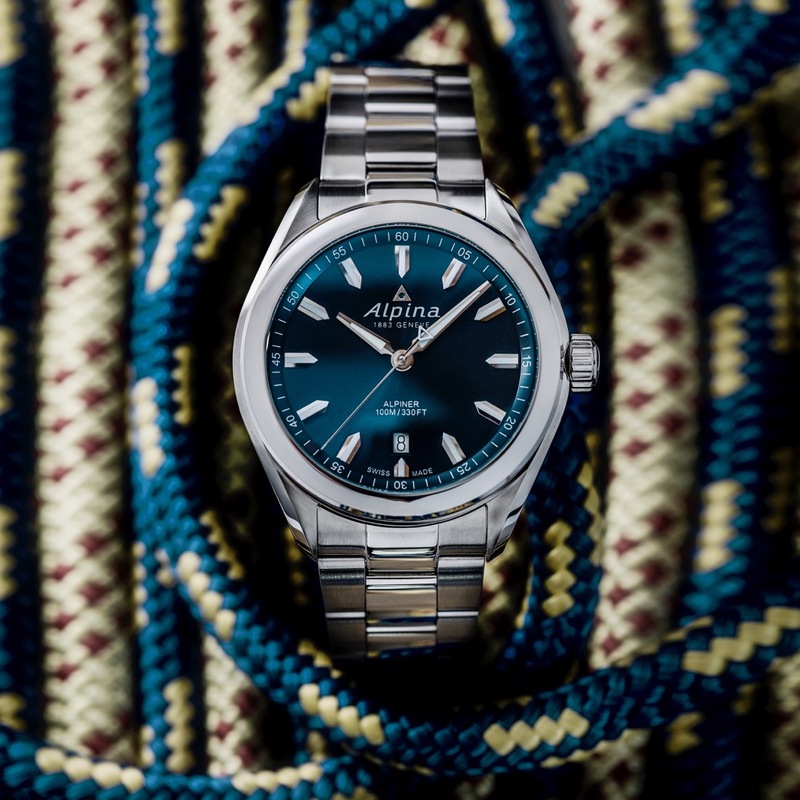 With the Alpina Alpiner Quartz, I am quite happy to see that they’re including the bracelet at the price point ($800), and that bracelet has a lovely two-finish treatment that not only mirrors what you’ve got on the case, it also gives things a more upscale feel. And that’s critical on a piece like this, which is likely to fulfill a multitude of roles. With the polished center link, that gives the watch a dressier feel, but you can easily swap it out to a leather strap for a more casual look. However, on the steel, things stay super flexible with what you can do with the piece. By this, I mean that you should consider the resistances that the Alpina Alpiner Quartz brings along. In this case, 100m WR means you can go swimming with the watch quite easily, which you would not want to be doing with a leather strap. In other words, my advice is to go for the bracelet as it is going to cover the greatest number of scenarios, as well as the fact that pricing remains unchanged.